After a few more days in Fort Myers, here is a compilation of scouting notes on some prospects who have caught my eye. 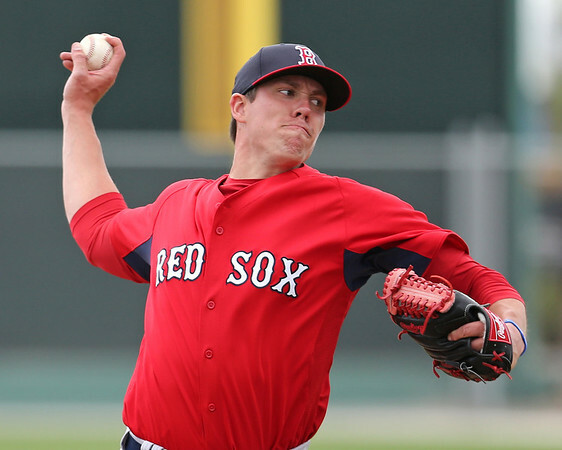 - Pat Light (pictured) was the third pitcher into the High A game for the Red Sox Thursday, but was the most impressive of the group over his four innings of work. Light has a live arm, and a long and projectable frame. His delivery is a little rough, especially from the windup, but he does a good job getting downhill plane when he gets on top of the ball. He worked in all three of his pitches in the outing, but each was inconsistent. Light came out 90-91 mph with his fastball in the first. He wasn’t commanding the pitch well, walking a batter and giving up a pair of singles on missed locations. He recorded one strikeout in the inning on a solid changeup that faded down and away from the left-handed batter. In his second inning, he seemed looser, reaching back for more velocity on his fastball. He topped out at 94 in the inning, and the pitch had late life and jumped on hitters, especially when it was down in the zone. That inning, he struck out two batters on perfectly located fastballs. He worked in his slider more, but he didn’t have great feel for it, wrapping his wrist which resulted in it coming in flat. When he got on top of the pitch it was much better, showing tighter break. He seemed to be working on something in the fourth inning as his fastball velocity dropped a tick and he started to miss his locations again giving up two hits. He was able to work around that though and get out of the inning, throwing a couple good heaters in on the hands. In his final inning, Light reached back again, working 93-94 mph. He was locked in with his arm slot and repeating his delivery well. He struck out two of the three hitters, both times with fastballs down and away right into the catcher’s glove. Light has one of the better arms in the system, and if he can improve his command should be able to excel in the low minors where he is likely to start. - Shortstop Deven Marrero, entered the system with a reputation as an outstanding defender and he has not disappointed over the last few days. In the morning during infield workouts, he showed off all his skills making play after play and showing off a plus-to-better arm. His actions are extremely smooth and he has excellent range both side to side and coming in on the ball. At the plate, Marrero has solid bat speed and his hands get through the zone quickly. These traits were on display in his first at-bat on Thursday, when he got a 2-2 fastball from the left-handed starter. He cleared his hips quickly and used a smooth, level swing to line the ball past the shortstop for a single. While Marrero looks more comfortable at the plate than during his time in Lowell, he still has work to do. One specific area he needs to improve on is his consistency from at-bat to at-bat, and his swing can get loose and long to the ball. - Right-hander Willie Ethington has yet to pitch above the GCL, but he has shown the tools that make him a prospect to watch this year. He has a nice pitcher's frame, listed at 6-foot-3, 190 pounds, and uses his height well to get heavy sink on his fastball. He sat in the low-90s with his fastball during his spring outing Wednesday, topping out at 94 mph. The pitch has late life, and can jump on hitters. His mechanics need some cleaning up, as he is stiff with his front side. He also has shown feel for two secondary pitches, a changeup and a curveball. He throws his changeup 82-84 mph, and while inconsistent, it can show fade and drop. His 12-6 curveball came in 75-76 mph in this outing, but last year in instructs he showed a harder curveball at 79 mph. The pitch is inconsistent, but at its best it shows tight rotation and bite, especially down in the zone.